There are only five elements in popcorn. All of them are the most important thing. Order is everything. Assemble as follows: pot—popcorn—oil. This is non-negotiable. Popcorn making is an active process. And it's more than just shaking it. Sound good? Okay. Let's break it down. Popcorn: Truth is, you get what you pay for. You can get the cheapest, no-name brand from the discount store, or fancy, $12 multicolored stuff from a high-end gourmet market. Our vote: go for something in the middle. While there are special occasions that call for something nice, our standard corn is simply the $3 bag of white popcorn from the supermarket. Oil: Use something that tastes good and has a high smoke point. There is no reason to go for extra virgin olive oil here: it's too smoky and you'll ruin the flavor compounds once you heat it up. Any of the following will work: canola oil, grapeseed oil, or peanut oil. If you're looking for something healthier with more monounsaturated fats, try extra light olive oil or avocado oil. Salt: Coarse-grain Kosher salt is our go-to for nearly everything. One of the exceptions? Popcorn. The grains are simply to big to evenly coat the craggy edges of popped kernels. Instead, you want something with smaller grains. Try a fine sea salt, or do what we did: place a 1/2 cup of kosher salt in the food processor, and zip it a few times to break it down. Store in an empty spice jar with a few unpopped kernels to help break up any clumps. The pan: For ideal stovetop popcorn, go for something with a thick bottom and a well-fitting lid. The ideal popcorn pan has high sides, and is about 8 -11" in diameter. The bowl: You want your bowl to be bigger than you might think to allow even stirring and seasoning. Something in the 3 qt. range is ideal. This is our favorite popcorn bowl of all time. 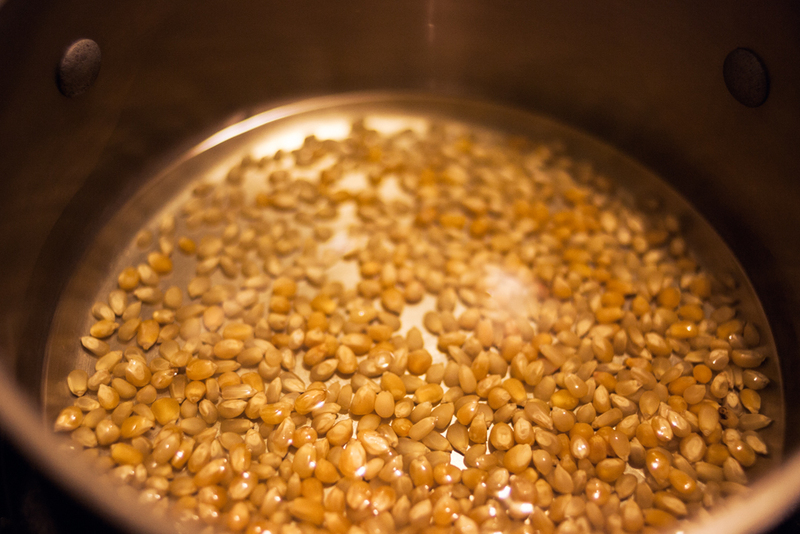 Toss in enough kernels into the cold pan to produce one layer on the bottom of the pot, with little space showing. You want a single layer, covering about 85% of the pot. 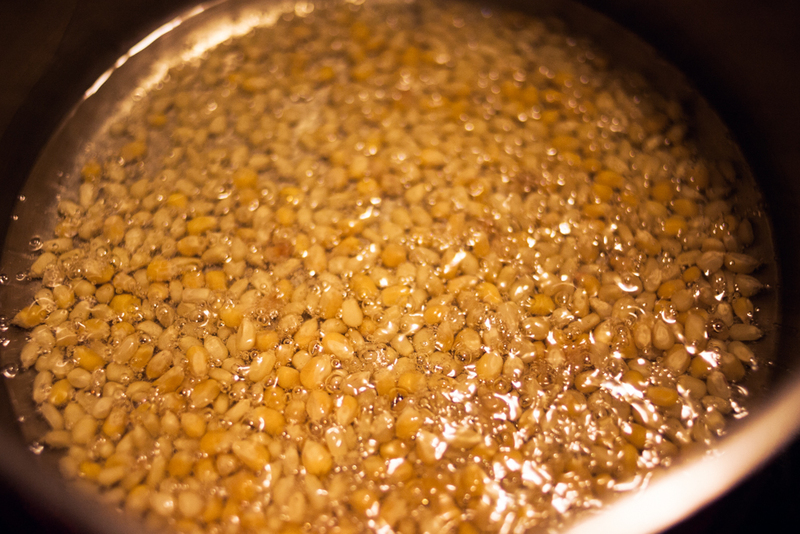 Without turning on the heat, add enough oil to cover the tops of the kernels. This is probably more oil that you're used to using. You will like the results. Agitate a little to make sure the oil has spread everywhere and plop the lid on. Okay, now the work starts. First, find a way to safely hold the handle in your dominant hand, and the lid in the other. Use towels, hot pads, etc. so you don't scorch yourself. 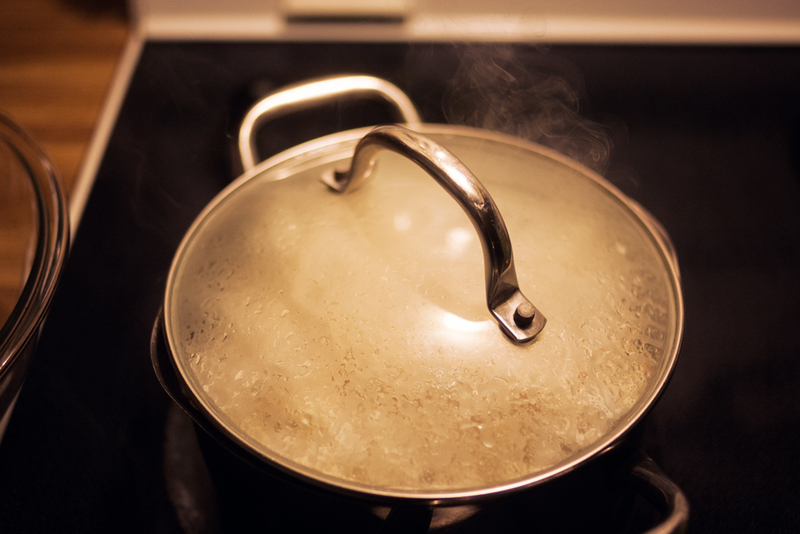 Figure out how to shake the pan while slightly lifting the lid to allow steam to escape. 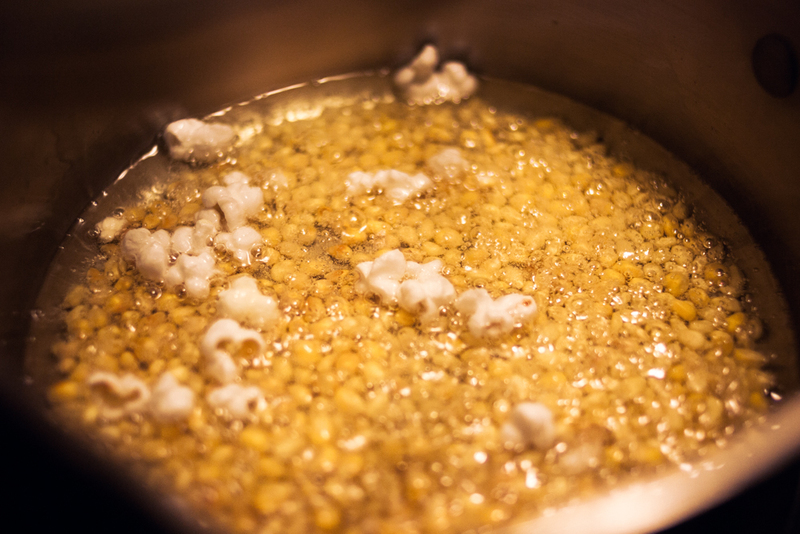 This the key to perfect stovetop popcorn. 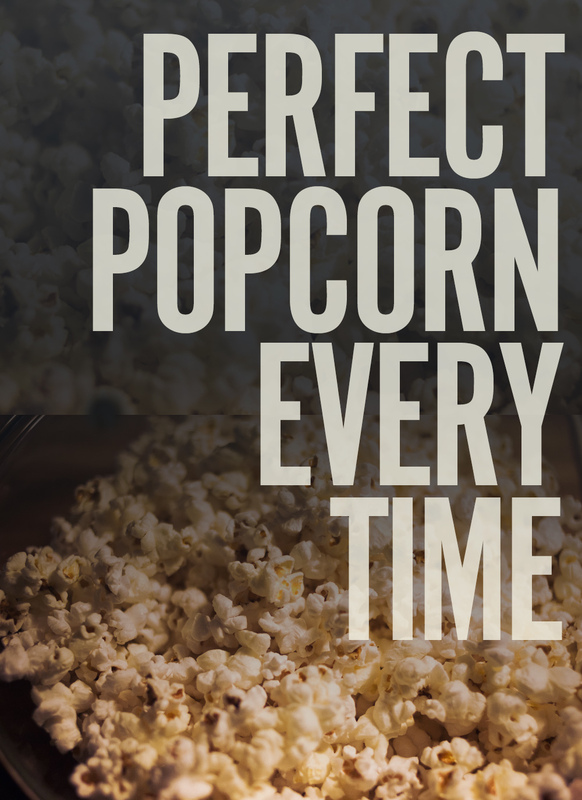 If you've measured correctly, you'll have more popcorn in your pot that can fit when fully popped. So when the popped kernels expand enough to reach the lid, you'll need to pour some off. This is the active part. 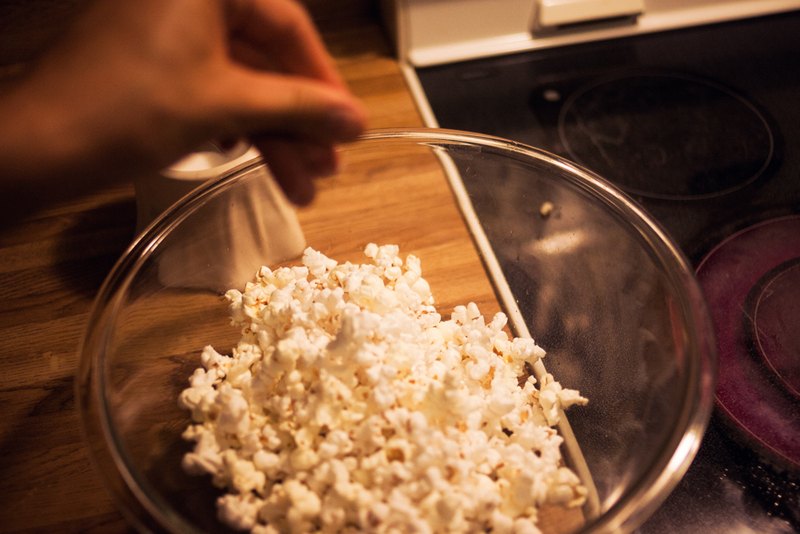 Remove the pot from the heat with one hand, tilt the pot over the bowl, and with the other hand, open the lid a crack to let some of the popcorn off the top into the bowl. Replace the lid, and place back on the heat. Salt the corn in the bowl with a fine layer. 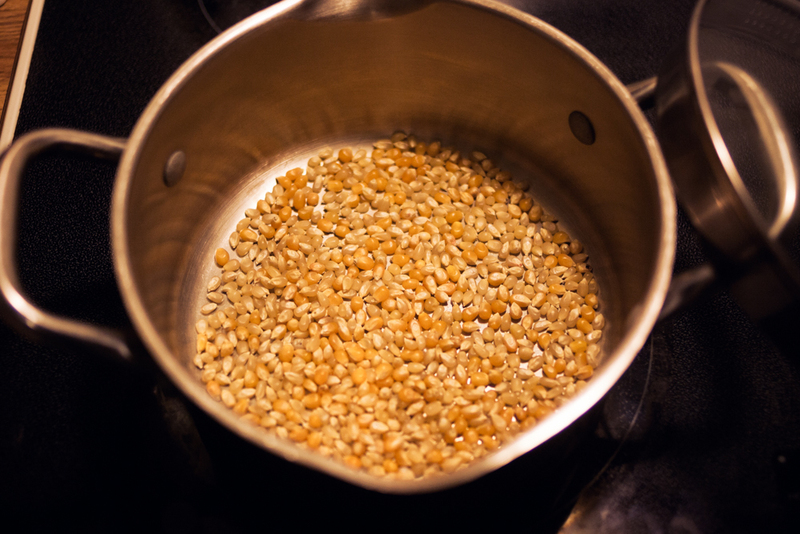 Place the pot back on the heat, shaking it a back and forth to get the unpopped kernels back to the bottom. THIS IS WHAT SHAKING DOES. It's not really about even cooking, but getting the not-yet-popped kernels back to the bottom. 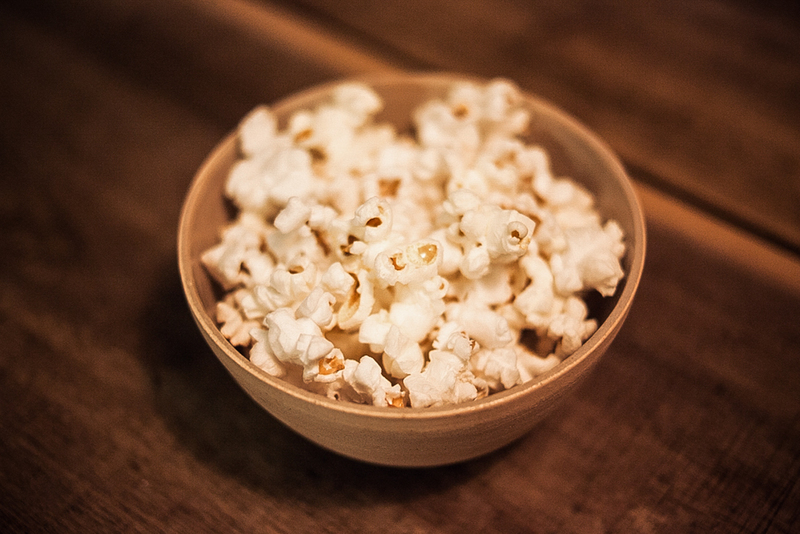 Let the kernels pop back up to the top one more time and repeat: crack the lid and pour off. Salt the bowl with a fine layer. If you're doing it right, you'll dump the corn a total of three times, salting in between each geological layer. Now. Shake the bowl up to thoroughly mix all layers. Taste it. Add more a bit more salt if needed, but only about half as much as you think you need. That's it. That's the perfect bowl of stovetop popcorn. If you like, you can add additional flavors. But it won't need it. 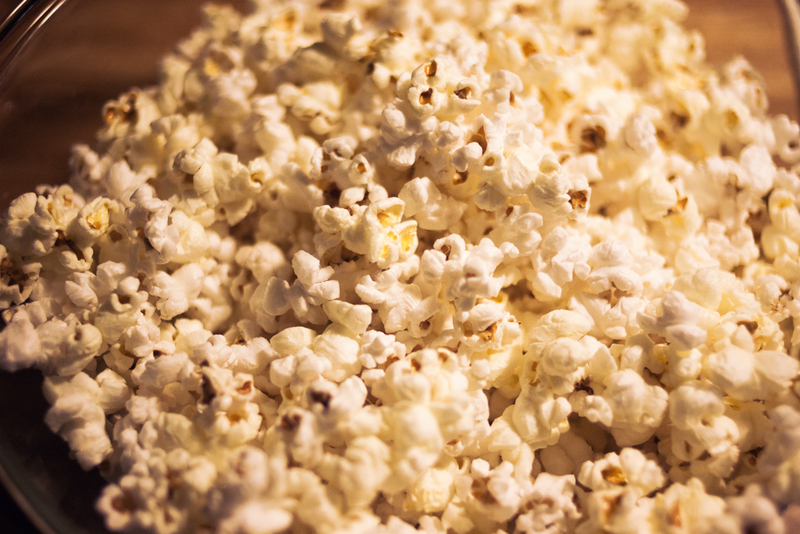 Finally: don't ditch your leftover popcorn! Once it's cool, store it in an airtight container to avoid it taking on ambient air moisture and getting soft, especially if you live in a humid area like the Southeast. You can eat it room temperature, reheat it in the oven for a few minutes on a sheet pan as-is, or make nacho popcorn by melting cheese and topping it with jalapeño slices and black beans. And just for kicks, I'll leave you with this sweet slow-motion footage of the moment when the heated water droplet contained in a popcorn kernel produces a pressure too strong for the kernel hull to contain it. @Bruno — That's a really nice alternative! For that matter, you can also use the single kernel when you're heating oil for deep frying but don't have a thermometer. Add oil to pan (enough to cover bottom). 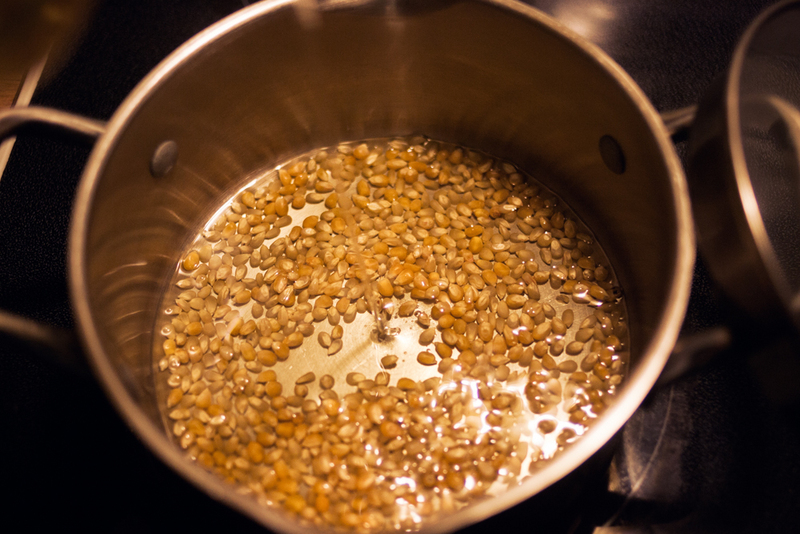 Put in one or two kernels and heat on high. When those two test kernels pop, your oil is hot enough. Add the rest of the kernels and remove from heat. Swirl them around the bottom of the pan for 15-20 seconds (getting them all up to the same temp). Now return to the heat and proceed (same as your instructions).